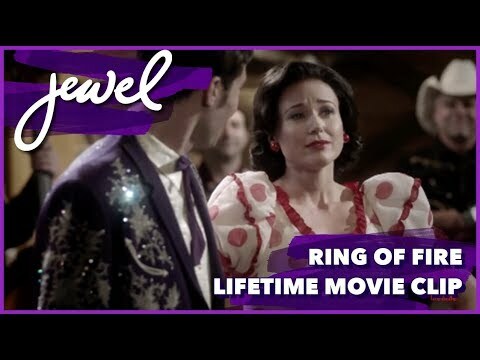 Four-time Grammy Award-nominee Jewel stars as legendary country artist June Carter Cash in the Lifetime Original Movie "Ring of Fire." Based on John Carter Cash's narrative of his mother's life, "Anchored in Love: An Intimate Portrait of June Carter Cash", "Ring of Fire" delivers a heartfelt telling of the famous singer's life, from her early beginnings in the rural mountains of Virginia to her turbulent, yet enduring, marriage to Johnny Cash (Matt Ross, "American Horror Story", "Big Love"). Told as only an insider could, "Ring of Fire" recounts June's meteoric rise to fame with The Carter Family, considered the First Family of country music, before breaking out on her own to perform, when she would become a legend in her own right. Taking a personal look at June's first two marriages, life with her daughters and touching relationship with her son, the movie showcases her infamous courtship with Cash and June's heroic role in saving his life during his battles with substance abuse, as well as how her unwavering faith in God, confidence and talent has taught lessons to generations. "Ring of Fire" also stars Golden Globe Award winning actress Frances Conroy (Six Feet Under) as June's mother Maybelle Carter, while music pioneer John Doe portrays her uncle, A.P. Carter, founding member of the famous group. The movie also features Grammy-winning country outfit The Peasall Sisters as The Carter Sisters. Jewel Kilcher stars as June Carter Cash and Matt Ross stars as Johnny Cash in Lifetime Television's Ring of Fire (2013). Photo credit by Annette Brown. Matt Ross stars as Johnny Cash and Jewel Kilcher stars as June Carter Cash in Lifetime Television's Ring of Fire (2013). Photo credit by Annette Brown. Matt Ross stars as Johnny Cash in Lifetime Television's Ring of Fire (2013). Photo credit by Annette Brown. Jewel Kilcher stars as June Carter Cash and Connor Beardmore stars as Lifetime Television's Ring of Fire (2013). Photo credit by Annette Brown. Jewel Kilcher stars as June Carter Cash in Lifetime Television's Ring of Fire (2013). Photo credit by Annette Brown.